Provide comfort for the family of Virginia Dorris with a meaningful gesture of sympathy. STEPHENVILLE, TEXAS Services for Nancy Virginia Dorris, 84 will be held at 10:30 am. Monday, February 11, at First Baptist Church of Stephenville with Dr. Ken May officiating. Burial will follow at West End Cemetery. Visitation will be 6-8 pm Sunday, February 10 at Stephenville Funeral Home. Virginia was born on May 28, 1934 in Fort Worth, Texas to the late Robert M. and Isabelle Evans Alexander. Her great-grandfather was Captain Sam Evans, an early settler, State Representative and Senator from Fort Worth and for whom Evans Avenue was named. She took great pride in her family history and was known for her civic and political involvement, her love of golf, art, family and friends. Following graduation from Arlington Heights High School, Class of 1952, Virginia was a Geology major at TCU. On June 26, 1954, she married her high school sweetheart, Ken Dorris. They started their family while Ken was stationed at Camp Chaffee, Fort Smith, Arkansas during the Korean War. While Ken completed his veterinary medical education, she was the secretary for the Texas A&M Engineering Extension Service – Firemen’s Training School and remained committed to firefighter causes for many years to follow. When Virginia and Ken chose to make Stephenville their home in 1965, she became active in the community and held numerous leadership positions. In 1969, she served on the committee to create the Stephenville Comprehensive Plan, forecasting and planning for the city’s future development. In the following year, Virginia was appointed to serve on the Planning and Zoning Commission, a position that she held continuously from 1970 to 2003. She was instrumental in the writing and adoption of the Zoning Ordinances in 1969 and 1984. She, again, served on the committee for the Stephenville Comprehensive Plan of 1990. While always active in local politics, Virginia served as Campaign Manager for Senator Bob Glasgow from 1981 to 1993, organizing events, speaking with constituents and managing campaign finances. During this time, she also supported and coordinated local activities for other statewide candidates. Virginia was an avid golfer and encouraged the growth of women’s golf in the area. 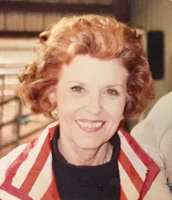 She played in golf tournaments across North Texas and was very involved in the Stephenville Women’s Golf Association. She was a member of the Texas Federated Women’s Study Club’s local chapter in Stephenville. She held various leadership roles within this organization. Her love of art and creative talent was displayed through her pottery and ceramics, as well as her involvement with the Cross Timbers Fine Arts Council. She competed in the Southwest Ceramics Art Show with her designs and paintings and twice won “Best of Show.” Virginia was a member of the First Baptist Church and lifetime member of Eastern Star. She and her husband, Ken opened Dorris Veterinary Hospital in 1968. They jointly, served on livestock show and rodeo committees and were integral members in the creation of the Cowboy Walk of Fame. Virginia was proceeded in death by both parents and her sister, Lavenia Smith. Virginia is survived by daughter, Debbie Dorris of Stephenville; son Ken Dorris and wife Julie, of Ft. Worth; three grandchildren, Katherine Dorris, Caroline Dorris and William Dorris; sister-in-law Patsy Hale of Cadwell, Georgia; and numerous nieces and nephews. The family wishes to thank Betty and Jack Pratt, the staff of Stephens Home Health and Alpha Omega Hospice for their loving care. In lieu of flowers, memorials may be made to Tarleton State University - Dr. Ken and Virginia Dorris Scholarship Fund, Box T-0260 Stephenville, Tx 76402. To send flowers in memory of Virginia Dorris (Alexander), please visit our Heartfelt Sympathies Store. Provide comfort for the family of Virginia Dorris (Alexander) by sending flowers.